If you’re a long-time Detroit Tigers’ baseball fan, you can look back on great summers of baseball and have a really good argument about what was the greatest summer of all. Recent years have been pretty good, too, with two trips to the World Series, and a number of playoff appearances. But for me — and many fans in my generation — nothing compares to the summer of 1976. That was a magical experience. A goofy, curly-haired rookie by the name of Mark “the Bird” Fidrych captivated the sports world with his electric right arm, along with an engaging, refreshing and bubbly personality. He was not just likeable, he was lovable. When is the last time you’ve heard that said about a professional athlete? Fidrych took baseball by storm 40 years ago. He made his debut on April 20, and only pitched one inning through mid-May. Then, on May 15, his world changed, and so did the world of Tigers’ fans. Fidyrch made his professional debut against the Cleveland Indians and pitched six innings of no-hit ball en route to a 2-1 victory. From mid-May to early July, Fidrych won seven decisions in a row en route to raising his record to 9-1. Fans were mesmerized by his talent and on-field antics. The Bird talked to the ball. He groomed the mound with his bare hands. He bounced around the mound like a cocker spaniel puppy. He smiled, he took curtain calls, he received standing ovations. Oh, and he was a dominant pitcher. Tiger Stadium would sell out for his starts. Keep in mind, just the year before, in 1975, the Tigers had lost 102 games. In 1976, the Tigers finished at 74-87, 24 games behind the first-place New York Yankees. But the team’s record was pretty much irrelevant. The Bird was the word all summer long. Fidrych was on the cover of Sports Illustrated and Rolling Stone. He was a celebrity, an athlete, much loved, and created a national buzz that few athletes have ever experienced. I was in attendance for his 15th win against the Chicago White Sox. He pitched all nine innings, allowed five hits, and the Tigers won 3-1. For years, I saved the ticket stub to that game. My brother Rick and I stayed for his curtain call. I felt like I was part of history, a witness to something incredibly special. I had goose-bumps just being there. I was 15 years old, and the Bird was my idol, and the idol of thousands of boys who played baseball. I still recall the night that he pitched against the New York Yankees on national television. It was ABC’s prime time game (this was several years before ESPN and the ensuing boom of sports on cable television), and the Bird was at his dazzling best in this late-June contest against those dreaded Yankees. “He’s giving me duck bumps and I’ve watched over 8,000 ballgames!” broadcaster Bob Prince said. 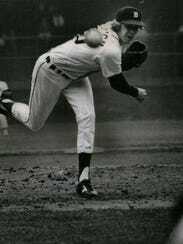 Fidrych won the game 5-1. It took only 1 hour and 51 minutes. Afterwards in his interview with Bob Uecker, Fidyrch was bursting with excitement. Nothing forced. All natural. Genuine. Minutes after the game ended, probably around 10 at night, one of my neighbors, Marty Ranville, from down the street walked to our house because he knew we’d still be up. He wanted to talk about the game. He was so pumped up about what he saw on TV. And so was I.
I don’t know if I slept that night. It was a rush, just like the entire summer was when he pitched. 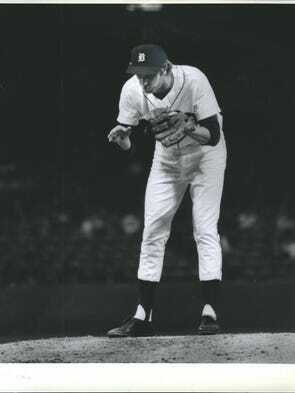 Fidrych led the major leagues with a 2.34 ERA, won the AL Rookie of the Year award, and finished with a 19–9 record. He was the starting pitcher in the All-Star Game, but, sadly, injuries piled up and his major league career ended after just five seasons. As a sportswriter, one of my career highlights was interviewing Fidrych at the Midland Mall. This was probably 15 years ago, and we sat at a table in the back of the old Sears store as autograph-seekers stopped by. Me sitting next to the Bird, and talking baseball. I never would have dreamt that in 1976. Forty years ago, Fidrych, who died in 2009 at the age of 54, was the brightest star in the game, and possibly the brightest star in all of sports. He was Elvis Presley for one summer. He shook up the baseball world. I remember it. I lived it. I was there. Simply put, it was the best summer ever for a Detroit Tigers’ baseball fan. NORTHBORO — A little more than 40 years ago almost to the day, one of this town’s native sons became the most famous athlete in America. 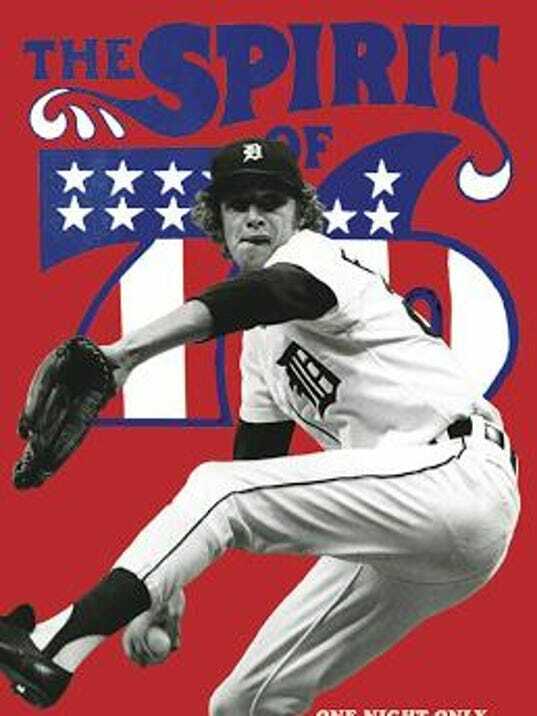 The precise date of Mark Fidrych’s transformation into "The Bird" is a matter of debate, but the most likely starting point is June 28, 1976, when he beat the Yankees at Detroit’s Tiger Stadium, 5-1, in front of 47,855 ticket holders and millions more viewers on Monday Night Baseball. The rest of the summer was the Summer of The Bird. Fidrych’s rookie season remains one of the great baseball stories of the 20th century. “I never pitched against him,” recalled Hall of Fame pitcher Dennis Eckersley, “but he pitched against us (the Indians), and in his first start. He beat us, beat Pat Dobson, 2-1, and that was the beginning of it all. There was a lot to be amazed about with Fidrych. In a game populated by grizzled stoics who had seen it all and done it all, Fidrych was an entirely new nation. He manicured the mound on hands and knees, raced over to thank teammates for hit-saving defensive plays and appeared to actually converse with the baseball. “I’ve never seen anything like it,” Eckersley said. “We started messing with him; you know, the ball, he was talking to the ball, next to the mound on his hands and knees, and someone threw a ball out there saying something nasty to him. “But it didn’t bother him." The game of baseball was in a trough by the time the 1975 season started, interest waning throughout the majors, but began to revive with the thrill-an-inning World Series between the Red Sox and Reds. Come the bicentennial Summer of ’76, the country was ready for more excitement, and Fidrych provided it. 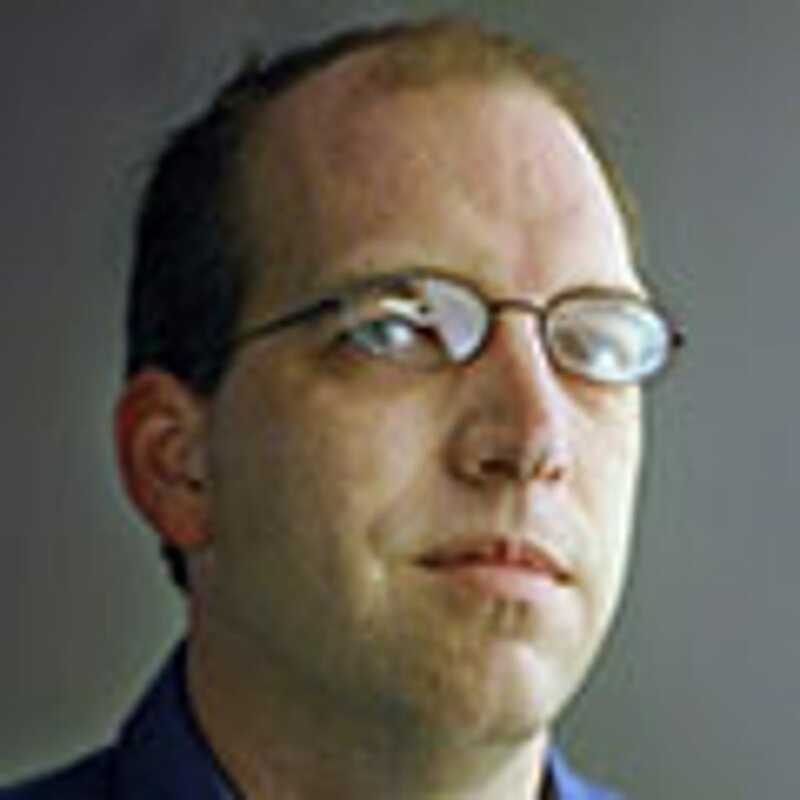 He was unknown to all but a few die-hard followers of minor league baseball, but not unknown to the Tigers organization. Detroit took him out of Worcester Academy, where he went after attending Algonquin Regional, in the 10th round of the 1974 draft, and Fidrych put himself on a fast track to the majors immediately. At age 19 in 1974 he was 3-0 with a 2.38 ERA at Bristol, Tenn., of the Appalachian League, a novice league that played a 70-game season. By the end of 1975, Fidrych was in Triple A, where he went 4-1 with a 1.58 ERA for Evansville. These were still the days of the four-man rotation, so Fidrych made the team as a reliever in ’76. It was not a good rotation - Detroit finished 74-87 even with Fidrych going 19-9 - and he eventually took Natick native Joe Coleman’s spot. After beating the Indians on May 15, Fidrych did not start again until May 25, in Boston. Despite the stands being loaded with of Fidrych’s family and friends, the game drew only 21,033. Despite another excellent performance by Fidrych, the Tigers were shut out by Luis Tiant in a 2-0 defeat, both runs coming on a home run by Carl Yastrzemski into the old screen. It was his last loss for six weeks. It did not matter. The wins began to mount up and Detroit’s baseball fans began to take notice. There were 15,583 in the stands for his first start at home, then 17,894 to watch him beat the Brewers on May 31. On June 11, the Angels visited Tiger Stadium and Fidrych beat them, 4-3, in front of 36,377. Batting second for the Angels in that game, behind future famous dad Bobby Bonds, was Jerry Remy. “The first thing you noticed about him,” Remy remembered of Fidrych, “was all his antics out there, the way he got ready to pitch. It was so emotional with the way the people loved him. He was really different than anybody I’ve ever faced. So was the lift Fidrych provided to the city of Detroit, and later on, all of baseball. “It was a totally different feeling in Detroit,” Remy said, “because you used to go in there and, you know, it wasn’t great. This guy brought an electricity to the whole place that was unbelievable. The crowds would go crazy and you would absolutely feel that in the box facing him. Fidrych was 7-1 when he faced the Yankees on Monday Night Baseball. The Yankees' only run came on a homer by catcher Elrod Hendricks in the second inning. After the game’s final out, a ground ball to second by Hendricks, Fidrych ran around the field shaking his teammates’ hands, then disappeared into the dugout to a standing ovation. Tigers fans refused to leave the ballpark even though it was raining, and eventually Fidrych returned for a curtain call. “You want to send a line drive right through his head,” said Willie Randolph of the staid Bronx Bombers. Fidrych was named to start the All-Star Game for the American League and did, although he took the loss. He slipped a bit after that, but finished the season strongly with three straight complete-game wins. He was voted American League Rookie of the Year and came in second to Baltimore’s Jim Palmer in the Cy Young Award voting. The Tigers' attendance increased from 1,058,836 in 1975 to 1,467,020 in ’76, even though they were never in the pennant race. Fidrych’s salary was $19,000 and the team gave him a retroactive raise to $30,000 and extended his contract for three more years starting at $50,000 in 1977. In ’77, Fidrych sufferered a knee injury in spring training and had surgery. He returned on May 27 and was as good as ever, running his record to 6-2 with a 1.83 ERA by beating the Red Sox on June 29. On July 4, though, with 45,339 in Baltimore for a holiday game, Fidrych threw a pitch and tore his rotator cuff. These days, surgery would have almost certainly restored him to full health. In those days, though, he just had a “sore arm.” The injury was finally diagnosed in 1985, far too late to do him any good. The Bird’s last major-league game was on Oct. 1, 1980, in Toronto in front of 12,426 fans. He went five innings and got the win in Detroit’s 11-7 victory. Mark Fidrych was 26 years old. There was one final hurrah, though, and it came in the minor leagues in front of almost that many fans. Fidrych tried to make a comeback with the Red Sox, who sent him to Pawtucket. On July 1, 1982, he pitched against Dave Righetti and the Columbus Clippers at McCoy Stadium, Righetti being punished by Yankees’ owner George Steinbrenner for having pitched badly a couple of times in a row. McCoy’s capacity then was 5,830. The game drew 9,389. Righetti threw his fastball past hitters. Fidrych pitched with guts and finesse and just kept hanging on. “It was about the seventh inning,” then-Pawtucket manager Joe Morgan remembered, “and he was in a jam, so I went out to take him out. But as I was walking to the mound, I said to myself, ‘We’ve got this crowd, this big mob here, and they came to see this duel.’ So I talked myself out of taking him out, which I never did, and the next guy up smoked a ball to the outfield. “It was a hit, but we threw a guy out at the plate, and another guy trying for, I think, third base, so we got a double play out of it. It was a tie, but they should have been ahead, and then we got a run when, I think, Dave Koza hit a homer. His teammates rushed to him after the game like he had just won the World Series. Fidrych finished his career in Pawtucket, retiring on June 29, 1983, but did not just drift into obscurity. He returned here, started a family, ran a farm and operated heavy machinery. There is hardly a town within an easy drive of Northboro that Fidrych didn’t work in, rebuilding a street, installing fuel tanks - he was instantly recognizable in his work, and unfailingly cordial in greeting the public and lending his time for charity. According to an article by Society of American Baseball Research member Rich Puerzer, Fidrych was nicknamed The Bird by Jeff Hogan, one of his coaches in Bristol. Hogan thought that Fidrych looked like Big Bird from "Sesame Street," which at the time, he did. While Fidrych had sort of a flower child persona, he was a very fierce and focused competitor, Blackburn said. “The talking to the ball stuff,” he added, “it looked that way because he would hold the ball in front of him like he was talking to it. I always took that as his way of telling himself what he wanted to to, and expressing it to the ball. The premature end to Fidrych’s career was not unusual for that era. He pitched 24 complete games in 1976, five of which went into extra innings. Fidrych then pitched seven complete games in 11 starts in 1977 before getting hurt. Fidrych was only 54 when he died in an accident on his farm in 2009, working on a truck. It was national news. Even fans who never saw him pitch mourned, such was his reputation. Unlike the world of baseball 40 years ago, which saw The Bird for the first time and couldn’t help believing it. He had one great season, and still, here we are, 40 years later, talking about Mark Fidrych. Some 90 people gathered at Cinema Detroit on Tuesday night to celebrate the enduring legacy of the former Tigers pitcher. The theater, along with the Navin Field Grounds Crew, showed a replay of Fidrych’s outing against the Yankees on June 28, 1976. Back then we called it Monday Night Baseball, and the platform helped introduce Fidrych to the nation. What it saw was an uncommonly unique performer, nicknanmed “The Bird,” — named after Sesame Street’s Big Bird — and all his eccentric in-game antics. The grooming of the mound. The chats he held with the ball. The aiming of the ball. He was different. Didn’t follow the flow of the game as much as he made it his own. He mowed down the Yankees that June night. Went on to win rookie of the year. And then … he was gone. That incarnation, anyway, felled by injury and a condition known as a dead arm. He never was the same after that summer of 1976. That his legacy endures after one successful season tells us a lot about the pitcher. But it tells us more about us, about what we value in our athletes, about what sticks in our memory. Fidrych didn’t bring the Tigers a division championship. Or a World Series. Or even the scent of a playoff race. In fact, the team lost more than it won that season. There were his fans, packed into a theater on Third Street near the Midtown section of Detroit, listening to tales of the pitcher and watching a replay of that game at Tiger Stadium. Some wore Fidrych jerseys. Other carried Fidrych gloves. Still others passed around Fidrych posters and baseball cards. They were here to swap stories, to keep his legacy going. They also were here because he transcended baseball, at least for them. To the system. To the man. To the decorum of the game. “He rooted around in the dirt and talked to the ball,” she said. And he smiled. Spread joy without trying. “An original,” said Dave Mesrey, a co-founder of the Navin Field Grounds Crew. Figuring out what is authentic these days is no easy thing. We live in a world of knockoffs, of the ubiquitous sales pitch, of a relentless push to the middle. Fidrych operated on the margin of what was expected. He carried himself like you or I might were we to possess a 90-m.p.h. fastball and a slider that darted and flashed like lightning. His outings became a kind of performance art, and wherever he went fans flocked. As historian, Bill Dow said in a recent profile for the Free Press, Tiger Stadium averaged about 18,000 fans a game in 1976. Except when Fidrych pitched, and more than 33,000 showed up. “He was more than a baseball player,” Mesrey said. How else do we account for a theater of patrons to watch a 40-year-old game? We don’t. It was all Fidrych. An athlete whose fire burned hot for a short time a long time ago, but whose embers still crackle.